This past weekend, we celebrated Father’s Day, and I thought about my father, a minister and psychologist, who was a man of few words. Despite having a rambunctious household with four sons, my dad rarely raised his voice and almost never showed anger. One Saturday morning, when I was about 10, I was persistently and overtly avoiding my assigned chores. At long last, my father really did get mad and shooed me out of the house to my assigned job of sweeping the front porch. What he did was perfectly reasonable and understandable. Suddenly, as I was sweeping, I felt my dad’s hand on my shoulder. He looked me in the eye and proceeded to apologize for his anger. I was shocked, taken back that he shouldered some responsibility for what had just happened. That encounter prompted a memorable conversation about responsibility within a family. It had a much greater impact upon me than any discipline or punishment could ever have done. His gracious approach drew me in the direction of a significant conversation and, in the end, of doing the right thing – not because I had to, but because I wanted to. In some ways, I long for the days when honest, real conversation was at the heart of our interaction with one another, and when gracious exchange was more the norm and less the exception. But the world has changed since I was 10, and there are powerful undertows that pull in the opposite direction. I want to focus on why Wake Forest is so committed to the art of conversation and how we see conversation linked to our responsibility to train the next generation of citizens and leaders. Last year, we surveyed our alumni and parent populations, generating six million data points that helped us understand their desires and pain points at a more empathic level. Across all ages, genders, races, political parties and religions, we found that our community mirrors the greater national sentiment: We are too “connected” to form real relationships, too busy to fully engage in community, and too disillusioned to commit ourselves to companies and causes led by people who don’t meet our expectations of a leader. Though we don’t like to admit it, this isolation leaves us lonely and hungry to be part of something bigger. Given the times we live in and the calling we are entrusted with, I want to offer some thoughts on why Wake Forest is so committed to the art of conversation and how we see conversation linked to our responsibility to train the next generation of citizens and leaders. We underscore the art of conversation, first, because: Conversation draws us out of ourselves to take seriously other people. Most of us have bought into the magic of digital connection. I use Netflix and Amazon to watch movies from a cabin in Idaho. I have my entire music library on my iPhone, and I can turn on James Taylor, U2, Willie Nelson, Norah Jones, the Blind Boys of Alabama, Bach or Beethoven anywhere, at any time. I regularly download books from Kindle. I take great pleasure in my iPhone and iPad, which, as their ad says, “provides the power to select what you hear, when you hear it, and where you hear it.” I am in charge. I have a million places in the palm of my hand. I am in touch but I am in charge – on my terms. These marvelous devices have allowed me to customize my life. From morning until night, I have come to live something of a plugged-in life. This wondrous technology has clearly changed many of my daily habits – as I am sure they have yours. The larger question is: Have they actually begun to change who we are and who we are becoming? This digital connection is even more profound for college students. Whereas about two thirds of Americans own smartphones—up from one third in 2011 – about 90 percent of college students do and over 50 percent have tablets. One recent study suggests that college women spend as much as 10 hours per day on their phones, eight hours for men. Sixty percent said they were probably addicted. Another study says that even during class college students check their phone or tablets an average of 10 times, spending as much as 20 percent of class time on such devices. Gadgets have a crowding-out effect on human interaction and that our attachment to these devices have all the markers of a behavioral addiction, defined as “something you enjoy doing in the short term, that undermines your wellbeing in the long term – but that you do compulsively anyway.” What is somewhat discouraging is applications like Google Mail, Facebook, Instagram, Twitter and Snapchat are actually engineered to keep us scrolling as frequently as possible. The software nudges us toward the habits the company seeks to instill. There is no inherent reason your phone has to ping every time a text or email appears. Or that the “Like” button on Facebook feeds a deep need that people have to have affirmation about what they post – and thus drives much more posting. Another example: Snapchat informs a reader as soon as someone else begins a message to them, which makes it something of a faux pas not to finish the message you start. And the Snapstreak feature displays how many days in a row two friends have snapped each other and rewards their loyalty with an emoji. Tristin Harris, who once worked on such human engineering for Google and is now working to combat such addictions, says that he considers his iPhone so addictive that it’s like having a slot machine in his pocket. 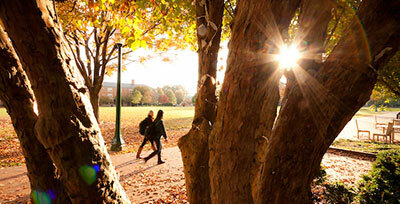 All of this encourages us at Wake Forest to redouble our efforts to keep conversation at the heart of what we do. Conversation combines ideas and human interaction, the intellectual and the personal. The art of conversation involves engaging the mind of another; it involves listening; it requires patience. Our lives and the lives of friends and colleagues are messy and conversing – coming together – requires being fully present. In this sense, real conversation is a deeply moral act, an act of character, because it means that I go beyond myself to be interested in my friend or to explore the views and feelings of someone I may not understand. Human relationships are rich but demanding. They require caring. In conversation, we are called upon to see things from another’s point of view. It is more difficult to stereotype and to caricature. We are forced to rethink cherished assumptions. We are not completely in charge. A second reason Wake Forest is linking conversation to leadership is this: Our world needs leaders capable of bridging divides. Levin is struck particularly by the weakening of “soul forming” institutions that can bring people together at the local and regional level. People of discordant beliefs and life styles have fewer places to interact, to understand each other, to find common ground. This spring, the Center for Advanced Studies in Culture at the University of Virginia released an in-depth analysis of the survey, titled “The Vanishing Center of American Democracy,” co-authored by executive director James Davison Hunter and Carl Desportes Bowman, director of survey research. In the current climate, politics has become much more bitter and vicious, bordering on rage. Peggy Noonan, last week, put it this way: “The media climate now, in both news and entertainment is too often of a goading insinuating resentment, a grinding, agitating antipathy.” Similarly, former Senator Evan Bayh noted: “We’re perpetually entrenched in a vicious cycle. Democrats and Republicans see one another not as patriots with divergent perspectives but as adversaries with heretical points of view. Adversaries have become enemies. Opponents are not merely misguided—they’re evil, even un-American. Parties have become tribes. And American democracy has been rent asunder.” Tom Friedman wrote yesterday that he fears Democrats and Republicans are becoming like Shiites and Sunnis. But it is not just politicians and journalists who are polarized. Increasingly voters and citizens distrust and despise each other. There is a growing perception that the opposing party is not just misguided but dangerous. In 2016, Pew reported that almost half of Republicans and Democrats felt that the other party’s policies posed a real threat to the nation. In 1960, just five percent of Republicans and four percent of Democrats said they would be unhappy if a son or daughter married someone from the opposite party. In a YouGov survey in 2010, that share had jumped to half of Republicans and a third of Democrats. Wake Forest also seeks to underscore conversation for a third reason: Conversation is the very heart of this learning community. In the face of rising incivility all around, at Wake Forest, we are striving to build a vibrant academic community that allows people of different backgrounds and convictions to live and learn together. Let me suggest that there are two foundational principles in forging a conversation rich community. The first has to do with personal interest and engagement. 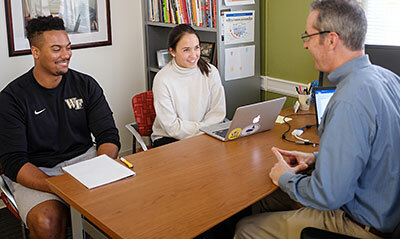 The greatest asset that Wake Forest has – and the foundation of any effective attempt to educate the whole person – is faculty, administrators, mentors, coaches, and campus ministers who are interested in their students and their comprehensive development. Jill Tiefenthaler once noted that what struck her about Wake Forest was how much our faculty actually liked our students. We believe that personal attention and interest is essential to the learning process. We know that the most powerful predictor of academic success at any level is when teachers take an interest in their students and believe that students can achieve. Why is this the case? Why does real personal interest often light the fire of insight and exploration? I think the answer is simple: students come to know they matter, and that is a game-changer when it comes to motivation. A vibrant intellectual community requires this kind of deep personal commitment. Such a community has great currency in contemporary America because it is in such short supply. We live in a culture that is increasingly impersonal, market driven, and achievement oriented. A recent study in the American Sociological Review notes that Americans today have a third fewer close friends and confidants than just two decades ago, a sign that people may be living lonelier, more isolated lives. One in four persons in the study had no close confidants at all, up from one in 10 in 1985. (A recent article in the Boston Globe noted that the problem is greatest for middle aged men – many of who let their friendships lapse.) The reality is that we are more connected – on the surface – but far more lonely. A community that is both rigorous and caring can be an oasis in a parched culture. It also involves another commitment: to foster this community as a vibrant crossroads of discussion and debate. In a day when higher education is critiqued for being far too monolithic in its convictions, we must ensure that we are a diverse and inclusive place for a wide range of opinions. A university is a place where academic freedom and freedom of expression are fundamental, a place that encourages community members to give voice to their beliefs, whether progressive or conservative, radical or traditional. At Wake Forest, we need to welcome real diversity of thought – even to those whose opinions we do not understand or appreciate. We can give our students the ability to disagree with courtesy and friendship. That is a balm that our nation and world desperately needs. I have often said that Wake Forest seeks to occupy a special middle ground, a place where people are welcomed into a community of conversation from backgrounds rich and poor, left and right, religious and secular, straight and gay. We strive to build a genuine community that has real diversity ethnically, nationally, and regionally. American higher education is diverse and intensely competitive. Colleges and universities strive to be the best – and not only in sports. They go the second mile to recruit star faculty, to build ranked programs, to see that their graduates win prestigious awards and fellowships, to enlarge their research funding. Rankings and prestige are the high-octane fuel that drives most of American higher education, for administrators, faculty, and students alike. But higher education also has a higher calling: to cultivate character as well as intellect, to call students to lead lives of purpose, to serve as a moral beacon for the students and the society that they are called to serve. These purposes might be called the recessive gene of higher education. They are acknowledged regularly, but are often given lesser attention – or masked by the dominant gene of prestige and self-assertion. 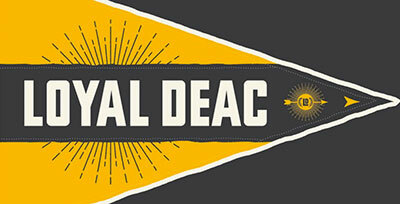 Wake Forest has chosen to bring to prominence some of these recessive genes: the importance of character development, of genuine community and conversation, of educating the whole person – mind, body, and spirit – and calling students to live lives for the common good. These are difficult challenges in the competitive world in which we live, but we have chosen to take up the challenge, to build a community that, in this respect, is slightly counter-cultural. A call to conversation implies we are willing to challenge the impersonal and privatizing currents of contemporary culture. Conversation draws us out of ourselves to take seriously other people. We are willing to counter the polarizing forces at play in politics and culture. Our world needs leaders capable of bridging divides. 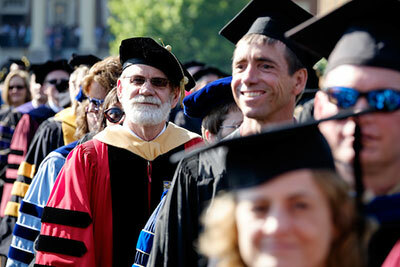 We will reinforce our long-held tradition that education must be deeply personal as well as intellectual. Conversation is the very heart of this learning community. Someone has said that a great conversation across a table is worth a month’s study of books. That may not quite be the case. But I do trust at Wake Forest our students will grow to love books; and even more, to learn to love those animating conversations that grow out of serious study. 1. Turkle, Sherry. Reclaiming Conversation: The Power of Talk in a Digital Age. Penguin Books, 2015.